August 7 2018. We were promised warm and muggy and that was what we got. 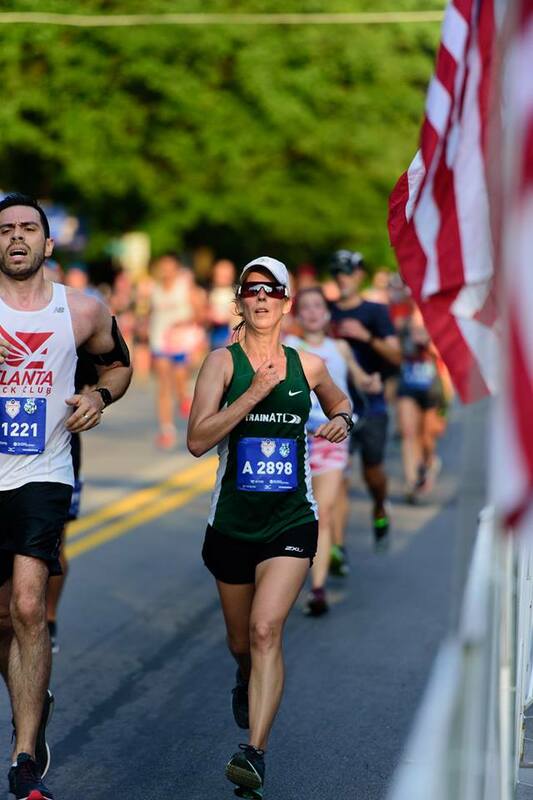 But we got so much more—The Atlanta Track Club has nurtured this road race along Peachtree Road into its status as an American Classic on the 4th of July. The race is the largest 10K in the world, capped at 60,000—just imagine how many would take part if they removed the caps!? With a huge American flag suspended over the start and a military jet flyover leading up to the Star Spangled Banner—What an Independence Day celebration! We were herded over to the Starting line at 6:15 by the efficient ATC Race Crew, and then the men were pushed over to the north lane to finish warming up so the Elite Women could start at 6:30 AM.. When we looked up at the flag, just before 7 am, the mercury was at 72, not bad, but the humidity was 100%. How can you have 100% humidity with no rain? I am not sure, but Atlanta managed it. The temperature climbed to 75 by 8 am with the humidity dropping only to 96%. Did we sweat? Oh yeah--like crazy! But that didn't stop a couple of firefighters from running in full gear nor a guy from running as Abe Lincoln in full presidential regalia, top hat and all. Flag-bearers and Uncle Sam's were also in sight. 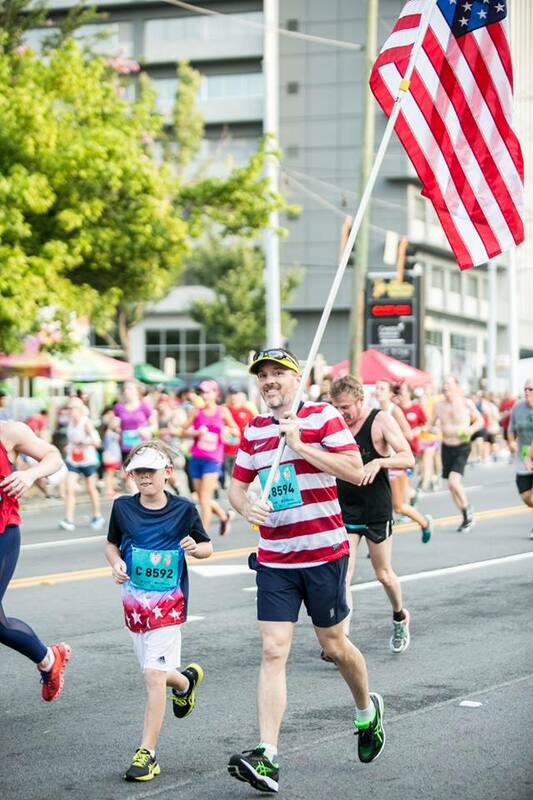 A Dad and his son carrying the flag as they make their way along Peachtree Rd.! The rest of us in singlets and shorts could hardly complain. On the positive side, clear skies and no wind for the race. Before the start, one of the officials announced that it was Condition Yellow, not ideal for running all out; runners were advised to dial it back a little and not focus on getting a PR. As you probably all know by now, one Masters Runner who did not dial it back was Bernard Lagat who, at 43, can still outrun all but the fastest of his rivals of any age. Last year after the race he promised the Race Officials that if they invited him back, he would run for the win. They were happy to oblige; it is always a delight to watch such a graceful runner. But Lagat is more than graceful; he is race tough! 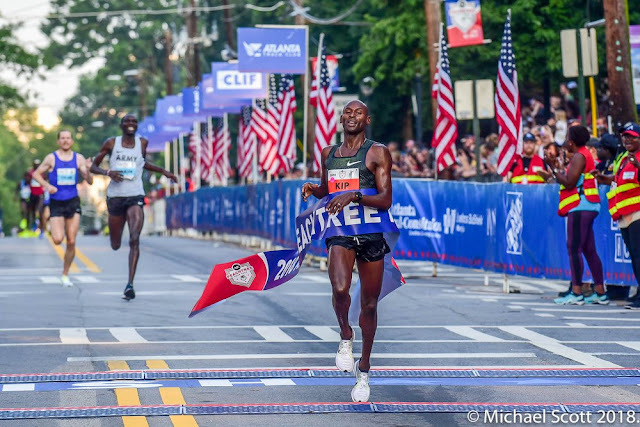 He was part of the lead pack for the whole race; as others felt their pace flagging after Cardiac Hill, it was Lagat and Lopez Lomong, the reigning 5000 Meter US Champ on the track, turning off of Peachtree for the final several hundred meters. But then as Lomong started to fade, Haron Lagat (apparently Bernard’s cousin) made a surge and looked like he might be able to catch up, but Lagat kept his pace going, with just one look back to make sure no one was coming hard, and powered over the last meters to take the race by 3 seconds over H. Lagat, followed by Tyler Pennel another second back, closing fast but too late. Sam Chelanga was also able to surge past Lomong to take 4th and earn enough points to overtake Leonard Korir as leader of the 2018 USATF Running Circuit. 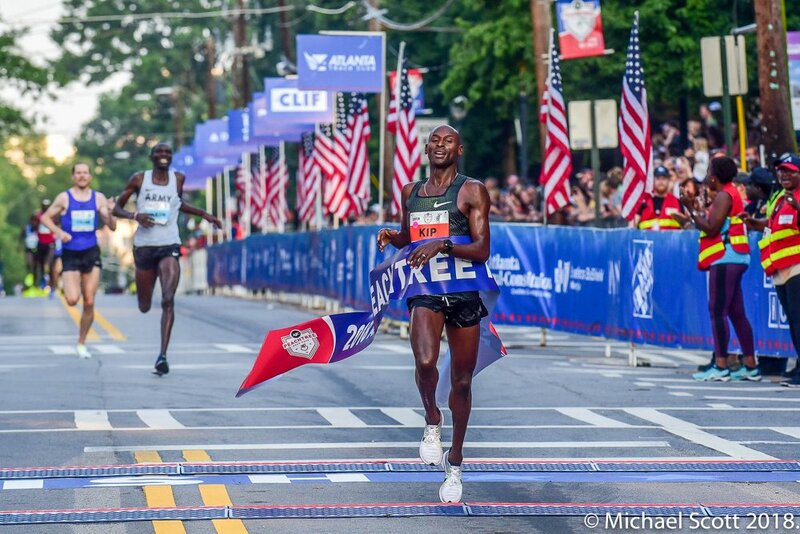 Lagat is the first 43 year old male runner to win an Open Championship in one of the major American Road races. To do it on the 4th of July was especially precious for Lagat, a naturalized US citizen originally from Kenya. Certainly his achievement brought pride to, and inspired, masters runners across the country. In a post-race interview, Lagat assured listeners that he would not let age be a limit, and that he would return to contest for a win again next year now that he knows h0w to train for a win at the race. Lagat’s remarkable achievement overshadowed another outstanding run by 46 year-old Kevin Castille, who finished 19th overall and 2nd Masters in 30:06. Third Masters place went to Run Minnesota’s Olivier Vrambout in 33:04.In terms of age-grading scores, Lagat hit 98.67, with Castille at 96.57, and Vrambout 85.63%. Ken Youngers, 61, finding his stride again after recovering from back surgery, clocked 37:30 for an 88.27 %, an ‘international class’ time. 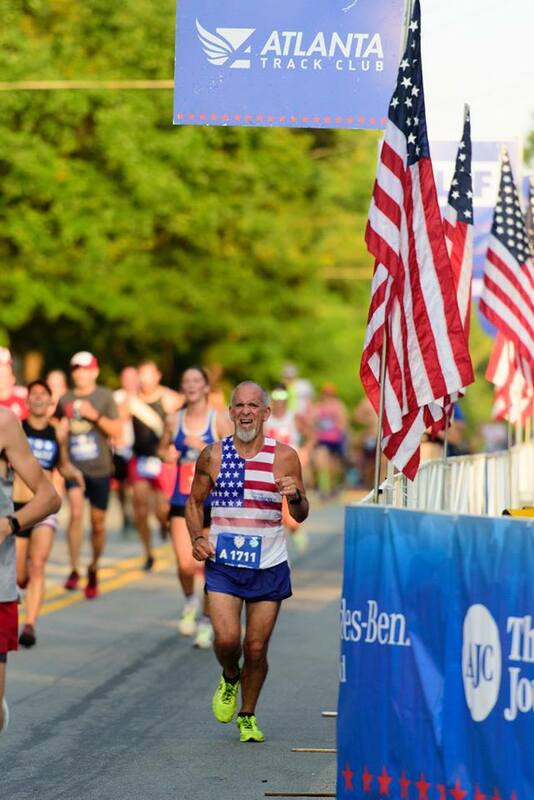 His Atlanta Track Club teammate, Mike Anderson, 60, finished 2nd in the age division in 40:14 for 81.52. Other men with national class performances [80% age grade and above] included: Brent Fields [34:59] and Peter Kotchen [36:38] who went 1-2 in 45-49; Wayne Goff [36:54], Simon Ahgove [37:36], and David Matherne [38:20], the 50-54 podium; the top 3 in the 55-59 division, Greg Oshust [37:22], Graham Merfield [38:21], and Filemon Lopez [40:13]. and Charlie Patterson [56:22] were able to claim victory in the 65-69, 70-74, and 75-79 divisions. Your author, Paul Carlin, finished 2nd to Frankfurter in 49:57 in Men's 70-74. 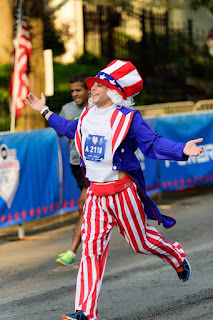 That was neither a time nor a place I am happy with so, like Lagat, last year, I vow to return in 2019; train a little harder, run a little smarter, and maybe win the division. Perhaps Lagat’s resolve and success will help me to find a way to come back all the way to my former fitness. [For those who are interested, I provide a bit more detail on my experience of the race below, at the end of this recap.] 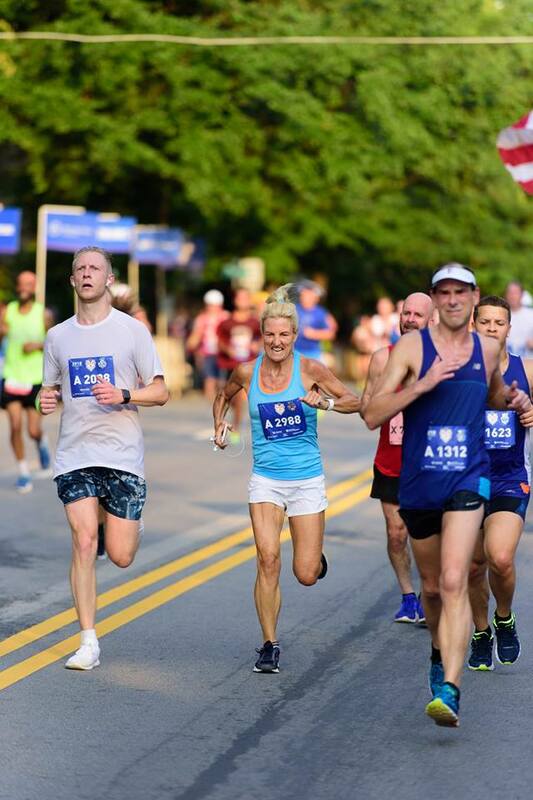 The oldest Age Division winner on the day was 93-year-old Lamar Perlis who took the 90-94 division crown with a 2:26:02.
followed by Kim Pawelek Brantly, 39:43 and 80.95 and Michelle Clarke, at 40:51 for 80.21%. 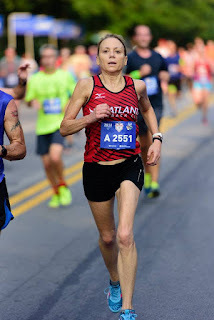 Other top (international class) age-graded performances were turned in by Atlanta’s Patrice Combs [43:29] to win the 60-64 division, and Mildred Deanes who took 65-69 in 50:46. Sally Brooking and Cheralynn Weaver who took 2nd and 3rd behind Combs in 60-64 with times of 48:05 and 48:11; and the oldest woman to finish, Betty Lindberg, who took the 90-94 division at age 93 with a 1:52:06. Other age division winners included: Elizabeth Murray, 70-74 in 1:07:41; Mary Kate Berglund, 75-79 in 1:08:13; B. Sue Harris 80-84 in 1:32:32; and Christine Beard, 85-89 in 2:11:35. My Experience. 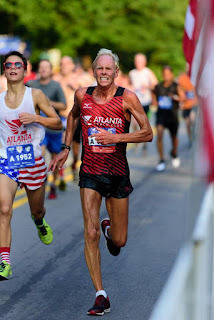 Mike Anderson, one of the mainstays of the Atlanta Track Club’s Men’s 60+ team, took it on himself to make sure I had a great time. 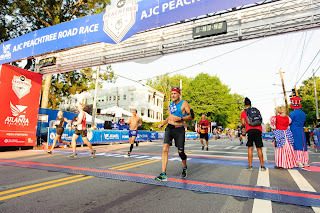 Mike did it all-from tips on how to get to the starting area with no mishaps to tips on running the race, providing post-race entry to the Atlanta Track Club’s area, and then a ride back to where I was staying. On his advice I had moved up my morning departure from my lodging from 5:45 to 5:30 AM and was glad I did. 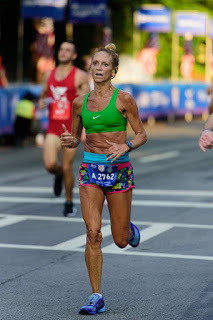 I appreciated getting to the Elite staging area at the Lenox Mall with time for some light jogging and stretching, and changing into racing flats, before we had to turn in our gear bags. It was fun to see top 40-something Masters runners like Bernard Lagat, Jen Rhines, and Kevin Castille warming up to do battle with the Open athletes. Elizabeth Unislawski, Chief of Elite Operations, and her charges, did an admirable job of keeping the elite runners organized, getting their gear checked and then the runners themselves herded over to the Elite corrals. It is a treat to see seasoned professionals plying their trade, a reminder that great races like this don’t take place without behind the scenes work from staff and thousands of volunteers. The starting horn sounded, and we were off. I knew the first 3 miles were mostly flat or downhill and had been warned to not go out too fast. I run naturally, rather than trying to hit certain splits. But at National Championship Masters races, I know many of the competitors and so can gauge my progress, to some extent, by where I am relative to them. In these nationally prominent races that are not part of the Masters Grand Prix circuit, I do not necessarily know many runners. So I do eventually check splits, but usually not for the first portion of the race, so I can find my own pace. 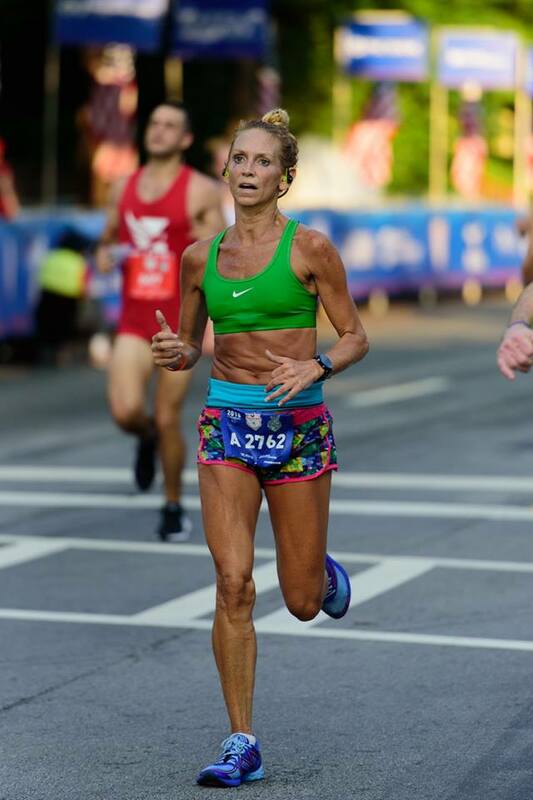 I could tell that my problem today was not going to be running too fast, just from how hard it was to keep up with runners who did not look like they would be running all that fast. And it turned out I was right—I had dreamed the day before of maybe having a very good run and hitting the 5K under 23 and possibly under 22 if it was all that fast. But, in fact, my watch read 23:34 at the 5K—not fast, but at least I was assured I had not gone out too fast. Next was Cardiac Hill which was a slog. But then at the top I had thought there was another major hill yet to go and misjudged. After another mile of running, suddenly, I realized we were at 11th Street and I knew we turned left on 10th Street and would have just a half mile to go. I should have started pushing earlier. I will know next time I race here. I finished strong, but only strong enough to break 50:00 by 3 seconds, over a minute slower than at the 10K Masters Championships in Massachusetts in late April. I had been almost certain I would run faster today. It was some consolation later when some regulars said the conditions slowed them by anywhere from 1 to 3 minutes. After the race I learned that the special 1% Finisher Mugs had a cut off for men at under 42 minutes, definitely out of my reach at present. Much to my surprise, once Mike got me into the Atlanta Track Club post-race celebration area, he presented me with the Mug he had earned, saying, “I have earned plenty of these; I don’t need another one. I would hate to see you go home empty-handed.” He’s just that kind of a guy. I accepted the mug as a token of friendship, and I am displaying it proudly and prominently along with other prizes I have earned. This one is a Friendship Mug. 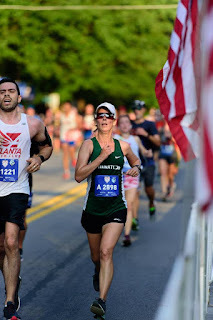 I would not learn until a few days later exactly where I finished in the Age Group. I hoped I had still run fast enough to land on the podium. 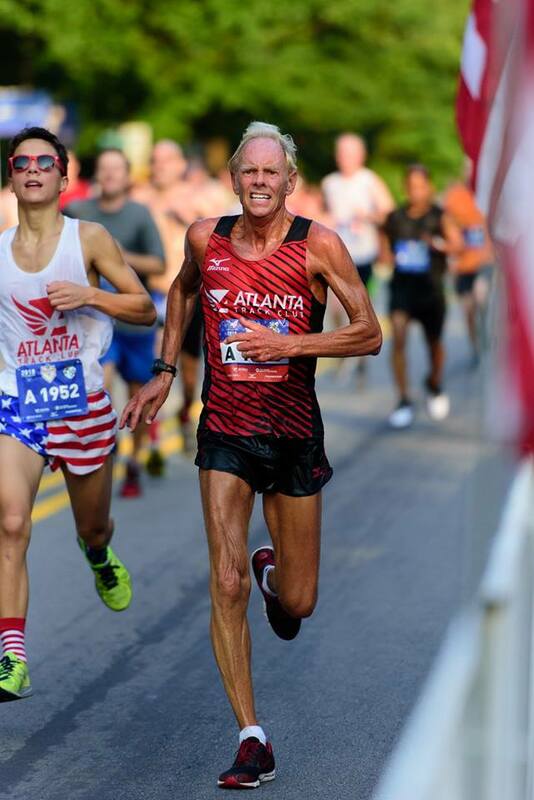 Anderson told me that in the days after the race, as an Atlanta Track Club volunteer, he matches age group winners with their photos (by bib #) to see if the bib # is correct. Because the race is capped, there are many runners who give away their bibs to those who have a stronger desire to get in the race. 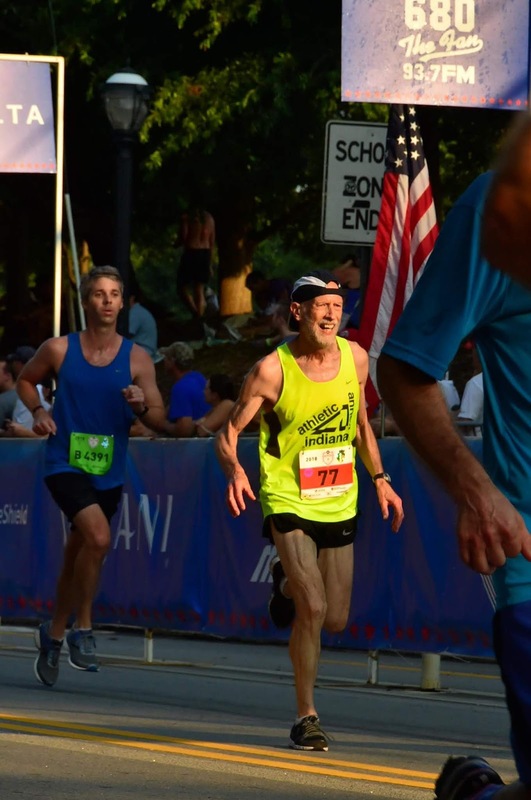 But if 26-year-old Andy is running with his 64-year-old Uncle Fred’s bib, all of a sudden it looks like Fred has run a great time for a 64-year old when it is actually Andy running a time that is within the typical range for a 26 year old. I learned later that I had taken 2nd, another bit of satisfaction. 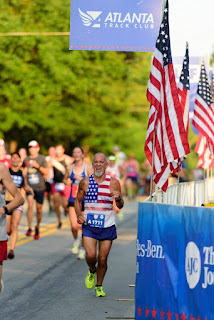 Don’t get me wrong; I am delighted to be able to run well into my early 70’s. But I am hoping to get my times back closer to where they were a few years ago in age-grading terms. My workouts have gone well recently. I know I will have a breakout race soon if the workouts continue to be good and I stay uninjured. 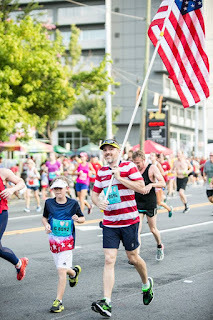 Regardless of how I felt about my race, the AJC Peachtree Road Race lived up to its reputation. It was a great experience all around. 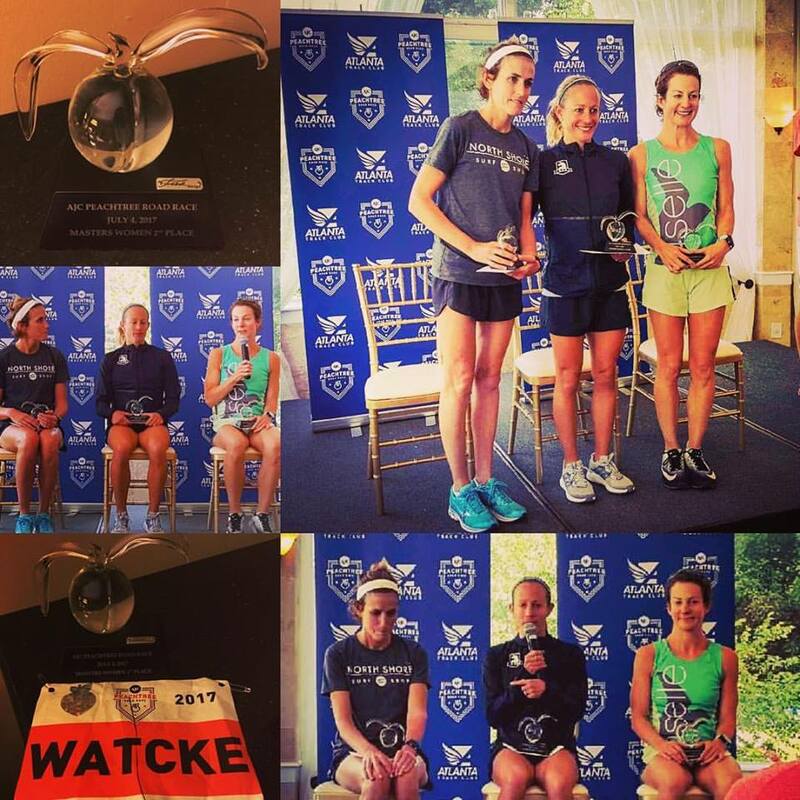 Thank you Atlanta Track Club and Atlanta! And that doesn't even start to mention the outstanding hospitality I got from Mike Anderson, who went way above and beyond to make me feel welcome and make sure I had an outstanding experience. 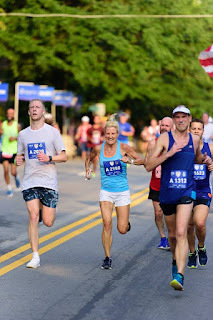 I also enjoyed meeting Elizabeth Unislawski who makes it all work for the Elite Athletes and hanging with Ken Youngers and Mike before and after the race. Let me add a shout out to all of the ATC volunteers, including Nonie, Cindy, and Terry who shared their table with me at the Elite Athletes brunch---I was lucky too--not a very fast race, but apparently fast enough to be the 2nd fastest 70+ year old in the race-I'll take it--Happy to be here and then some! In fact, I enjoyed myself so much that I am coming back on August 18th to race in the USATF Masters 5K National Championship, hosted by the Atlanta Track Club's Atlanta's Finest 5K. Perhaps I will see you there? 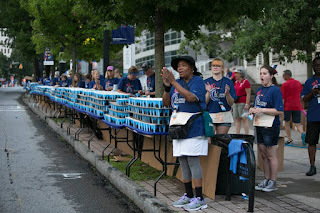 And thanks to the thousands of volunteers who make the AJC Peachtree Road Race the American Classic that it is! 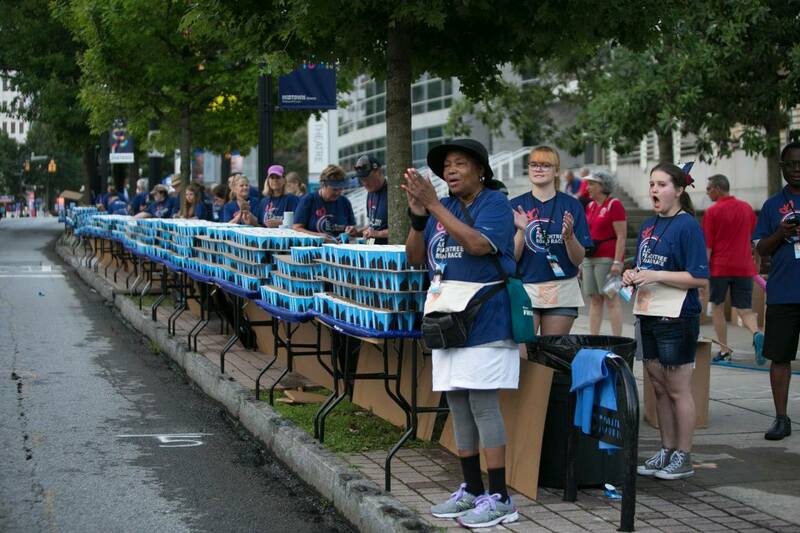 Water Station Volunteers cheer on the Runners! PHOTO CREDITS: All photos without a watermark or a photo credit under the picture were gathered from the Atlanta Track Club's Facebook page and are used courtesy of the Atlanta Track Club. The photographer is Paul Ward. 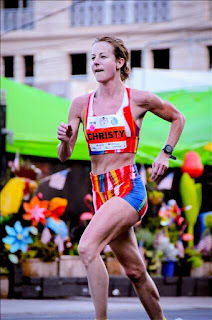 *In most USATF Open Championships and other prominent Road Races, the Elite Women start several minutes before the Men and the entrants in the community race. By USATF rules, these are two separate races. Women athletes who fail to start with the Elite Women are not eligible for Overall Awards and those who do start with the Elite Women are ineligible for Age-Division Awards in the Community Race. 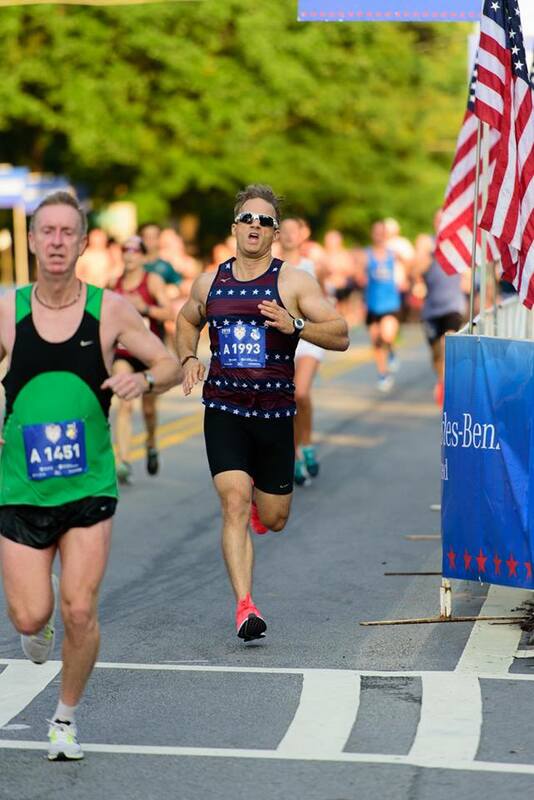 Because the Elite Men and the male entrants in the Community race start at the same time, that is one race and all athletes may be eligible for both Overall and Age-Division Awards. Great article Paul, I always look forward to hyou articles.